It has been a few days since I updated the blog. It has been a few busy days filled with a lot of anticipation and trying for new opportunities. All this rest has led to me thinking a lot and I have realized that I have been unfair to smaller cities in our country. India is a huge country, we have a lot of cities, towns and villages of all sizes. I belong to one of the bigger cities (I guess) Jaipur and spent my working years in Delhi and now in Hyderabad. I have been a snob (I now accept) selling the smaller cities short. I have always found people's perception of India a bit too funny and it is quite a sight to see them looking at a mall and getting all confused. I used to be really worried that we might get stuck in a situation where we would not find any transport option. Hiring a taxi is simply not our style and many sites are 40Km or so away from the nearest main city. 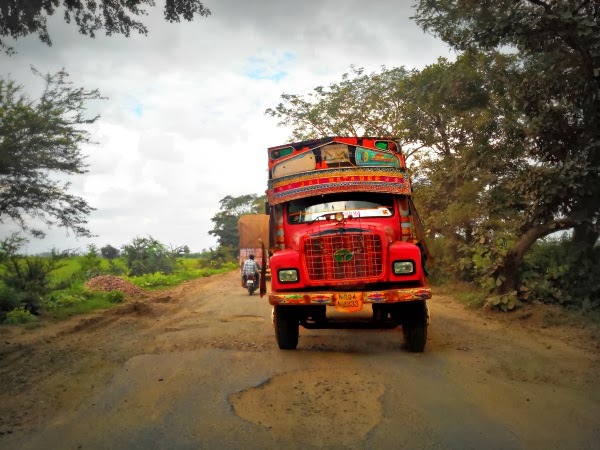 This was a concern when we got down at Obaidullahgunj and could not find a bus to get to Bhimbetika caves. We ended up hitching a ride on a tempo for school children after waiting half an hour. Obaidullahgunj though a small town had all the shops you could ask for and ample transport options. Bottom line there is always some transport available. We found state bus straight to Bhopal on our way back. We become so used to eating out in bigger cities that we question food availability in smaller cities. Rest assured that on all normal circumstances there will be good food available within reason. 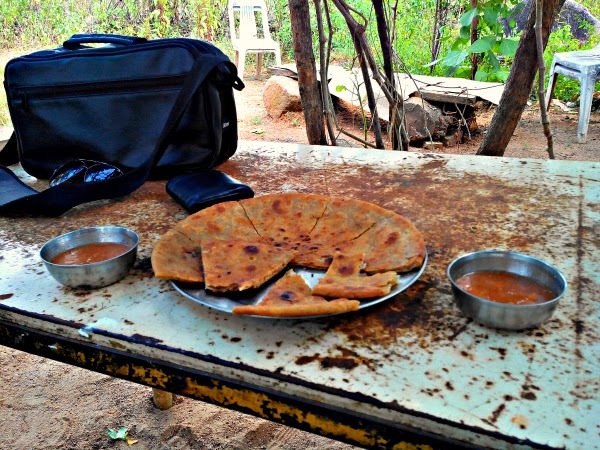 We had probably the best Aloo paratha ever in a small road side shack in Khajuraho. Aj had a cheese omelette for breakfast at Raja Cafe right in front of western groups of temples while I sipped on iced tea. It might not be exactly what you want but it will most probably be good like the dinner we had for Rs 63 near Vidisha railway station. We had no accommodation for the night at Bijapur and were hoping to get a bus to Hyderabad the same night. Spending night at the bus station was looking like a real possibility but we found a really helpful bus driver who directed us towards the bus bay and assured us against many other who told us that the last buds for the day had left. We got the bus and reached home a day earlier than what seemed likely. This is just one of the few examples also Bijapur is not that small a city. People in our small tempo traveler from Pattadakal to Badami. You see just two rows there were people behind us and many more got on. Visiting famous and big cities takes away a lot of novelty from your travel. 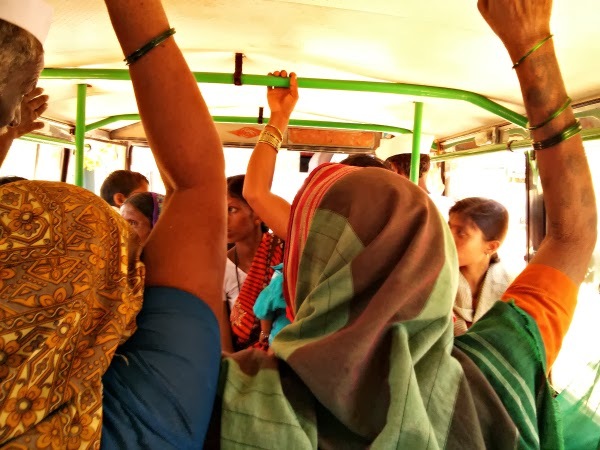 Unless you take a jeep from Fatehpur Sikri to Agra you will never understand how a jeep can fit in almost 15 people and still everybody reaches their destination safely. Or unless you take the bus to Badami from Kerur which stops over 10 times in the 20 Km distance between the two towns. When I say that the bus stops I mean engine is dead and a swarm of people get in and get out at the same time. We reached Mahabalipuram drenched in sweat in peak summers and were itching to change clothes we had been traveling in since last night. We found toilet complex in the Pandava's Penance compound and it was clean, had water and was actually usable. Expecting something similar I entered the toilet complex at Bijapur bus stand and it had the honor of being the WORST toilet I have ever visited. I practically ran out and waited till we sat down to eat to use the facilities. We sat down to eat in the evening no need to mention how good it felt!! I have started to see smaller cities in a new light since this year. Sure there will not be the obvious luxuries that we are used to but you will get by easily. A sense of humor helps for sure. I love the advice you give here. Some of my favorite experiences visiting India back in 2010 were when I explored some gypsy towns in frontier areas of Rajasthan. Its like things in your backyard. Here the news is always about metros and with the things we are used to smaller cities are not at the top of our minds. Khajuraho and hampi have been my favorites since forever.